Zoom Airlines was a low cost airlines of Canada with its main base in Ottawa, Ontario. Apart from connecting major destinations of Europe, Zoom Airlines also provided air flight services to South America, Caribbean, and Southern United States. It was also famous for its charter flight services for different countries. All the flight services were ceased due to the bad financial positions in 2008. 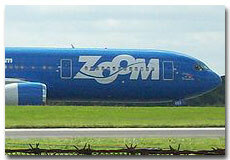 Zoom Airlines was founded in 2002. Initially it was started with an aim to provide low fare carrier.